This time I did garlic and herbs. But no salt. Nearly everything needs some salt, but these do okay without it. This fall I plan to start baking my own bread. I haven’t started yet because a) I’m not generally a baker, and b) it’s hot out. If I’m going to be experimenting with the oven, I’d rather do it when I won’t mind having it on half the day. 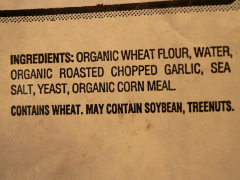 But once I get fast at it, I don’t ever want to buy another pre-made bread that has corn syrup in it. Check yours, if you buy bread. Odds are it’s in there. Until then, I really like the bread they have at my grocery store. 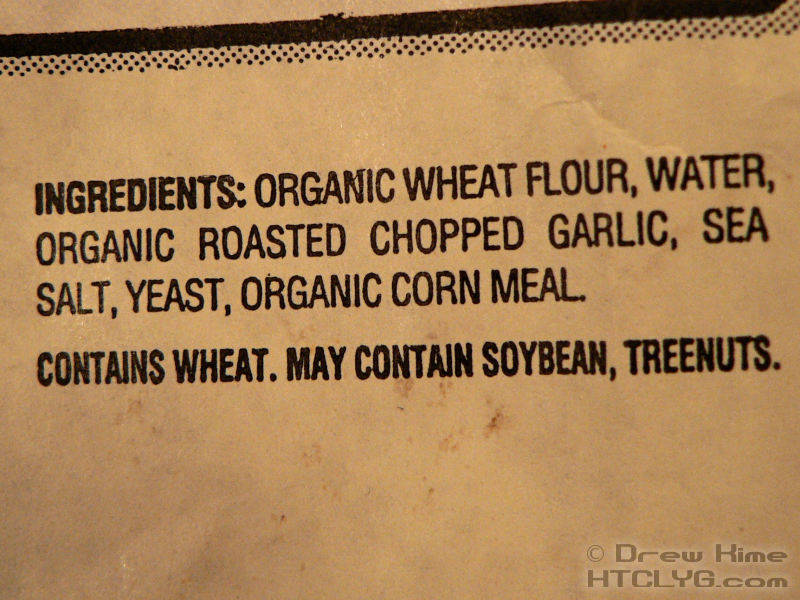 Check out these ingredients. I can live with that. Their sourdough is great, but for today’s croûtons I got the garlic. Good texture, chunks of garlic throughout the loaf. Really nice. 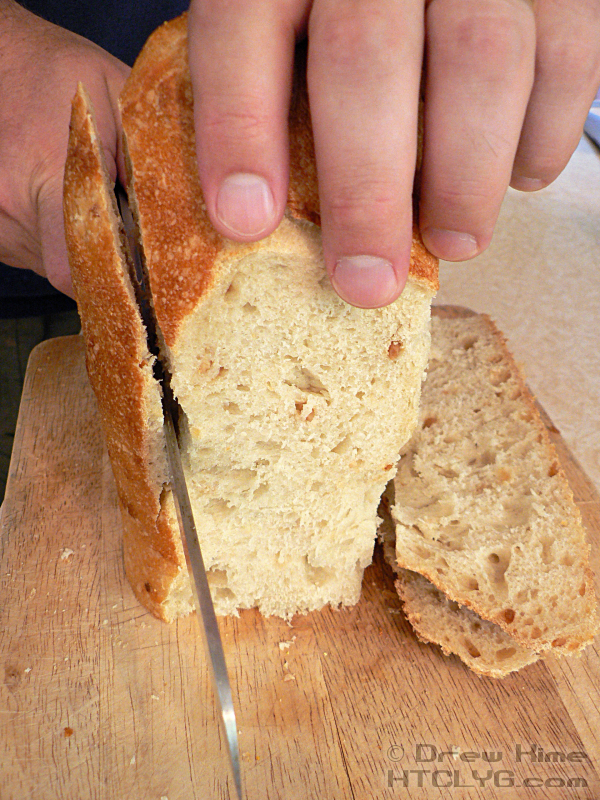 To start, trim the crust off the bread. I like to stand it on end and trim from top to bottom all the way around, sort of like how you’d peel a cucumber without a vegetable peeler. 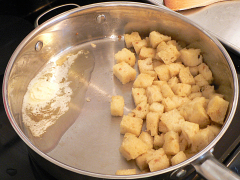 Once it’s crustless, cut the bread into bite-sized cubes and melt some butter in a pan, with an equal amount of olive oil. How much butter? That really depends on how much bread you’re doing. This was about two tablespoons of butter, and two tablespoons of olive oil. Add the bread cubes. So how big is “bite-sized” anyway? 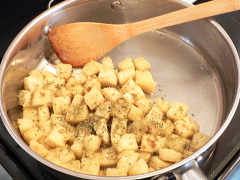 For soup, I like nice big chunks. For salad I like them smaller. 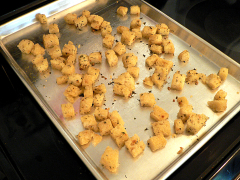 Smaller ones get more crunchy, bigger ones can be crispy outside and soft inside. 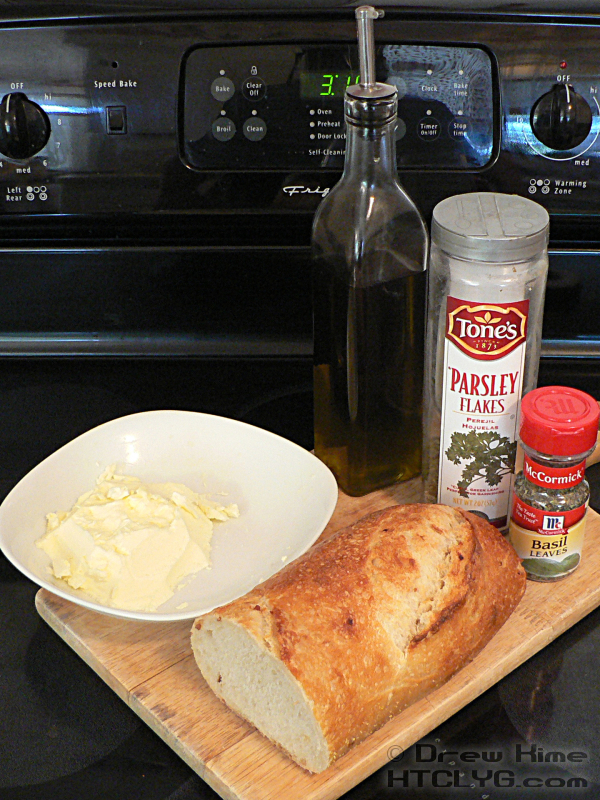 Toss the bread around to make sure it gets a good coat of butter/olive oil all the way around. If it all gets soaked up and lots of the bread is still dry, push the bread to one side and melt some more butter and olive oil. Once all the bread has a nice coating of butter, olive oil and herbs, transfer to a baking pan, large enough that the bread is all in one layer. 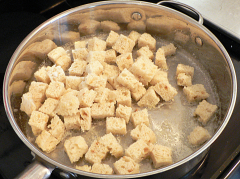 Bake at 400° for about 10 minutes, turning the cubes once with tongs at about 8 minutes. Remove when they are golden all the way around. Let’s see, creamy Italian dressing, bacon bits, and now herbed croûtons. What ever could this be leading up to? If you don’t want to wait an extra minute to find out if your guess is right, fill out the form at the top of the column to the right. You’ll get everything via email as soon as it comes out. These work best of you start with a bread that already has some flavor in it. Something with garlic baked in, not brushed on after it's baked. 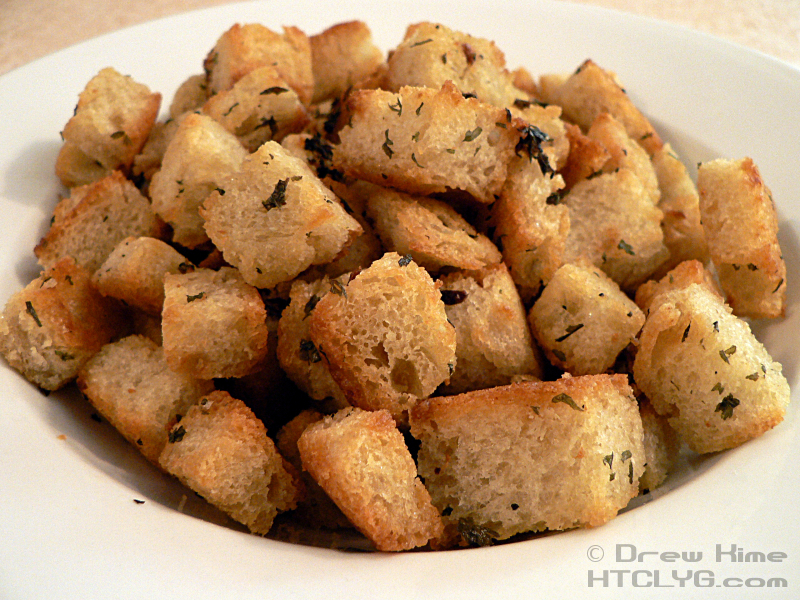 Cut the crust off the bread and cut it into bite-sized cubes. 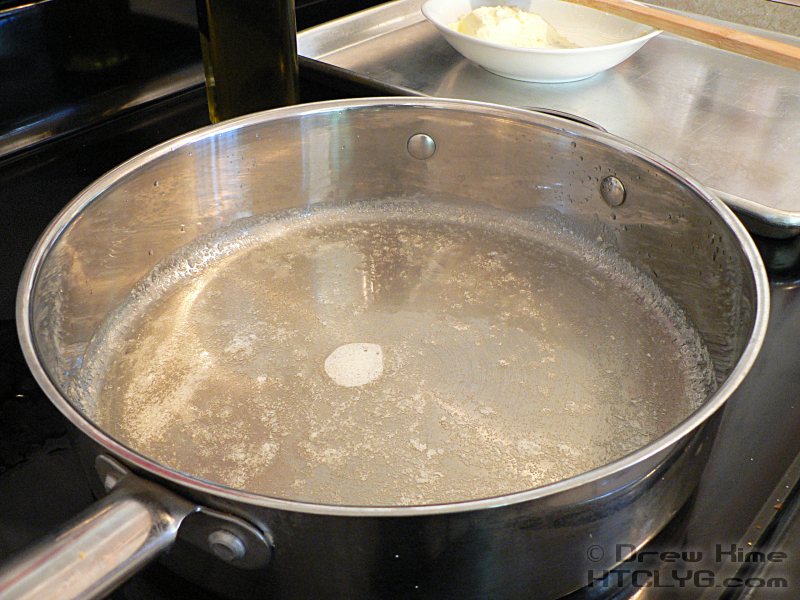 Melt some butter in a pan, enough to cover the bottom of the pan, and add an equal amount of olive oil. Add some of the herbs. Toss the bread in the butter and oil, working in batches. Each piece of bread should have a coating of butter/oil and herbs. 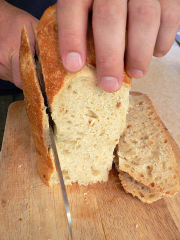 Transfer the coated bread to a baking sheet. Bake at 400° for about 10 minutes, turning the cubes once with tongs at about 8 minutes. Remove when they are golden all the way around.